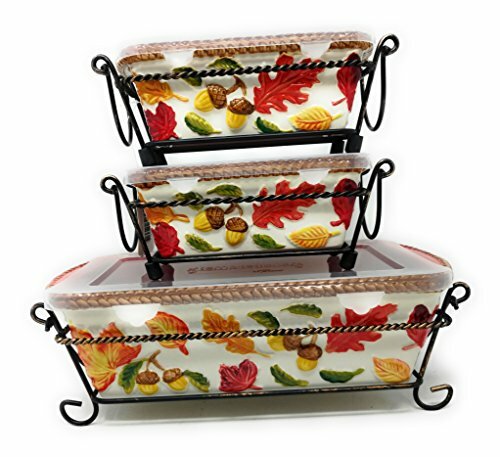 Temp-tations Set of 3 Loaf Pans w/ Plastic Covers & Wire Racks, Stoneware (Harvest) by Temptations at The Primavera Blog. MPN: unknown. Hurry! Limited time offer. Offer valid only while supplies last. NOTE - THE BOTTOM OF THE LARGEST LOAF PAN IS MARKED AS 1.5 QUART, BUT WE HAVE TESTED IT AND IT IS 1.75 QUART. It's just marked wrong on the bottom. NOTE - THE BOTTOM OF THE LARGEST LOAF PAN IS MARKED AS 1.5 QUART, BUT WE HAVE TESTED IT AND IT IS 1.75 QUART. It's just marked wrong on the bottom. New in original box. Temp-tations set of three loaf pans with covers and wire racks. 1-3/4-qt ceramic loaf pan, and 2 mini-loaf pans in 12 ounce sizes With plastic covers and wire racks Loaf pans are ceramic construction Ceramics are dishwasher-, microwave-, refrigerator-, freezer-safe; oven-safe to 500F ... Outside measurements for the larger loaf: 11-1/8"L x 5-3/4"W x 3-1/4"T ... Outside Measurements for the mini loafs: 6-3/4"L x 3-7/8"W x 2-1/2"T ... Tara says - "I wanted to create something beautiful that would go from oven to table to refrigerator to microwave to dishwasher, all in one dish. And temp-tations® does just that." This item is a closeout from Temp-tations but is new in it's original box.